The most beautiful place in Svetlogorsk – river`s bank square. 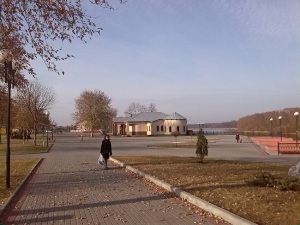 It hosts city events, dwellers and city guests like to walk along the river Berezina. But on this all territory total length of not less than a kilometer there are no litter bins and benches for the rest for citizens. Here are the restaurant «Ksaft» and a Catholic church. Also here is monument to the soldiers-liberators and soldiers in Afghanistan, stage area for performances of musical groups, restaurant on the waterfront near the water. Great place to stay! According residents on this all territory total length of not less than a kilometer there are no litter bins and benches for the rest for citizens. But the promenade area come to rest not only youth, but also parents with children, the elderly. And is completely nowhere to sit and to rest. Is executive committee and members of the District Council are don`t see fixedly the lack of benches and litter bins on the waterfront? Or maybe they do not visiting the embankment? Or it is contraindicated for their health to sit on hard?